Giving back is a great way to fulfill your community service requirement for school students, build your resume, and make a difference in your community. We, Viet Holiday Travel, have recently noticed that a growing number of schools abroad wanting to give back and requesting that community service and volunteering be included in their tour itineraries. 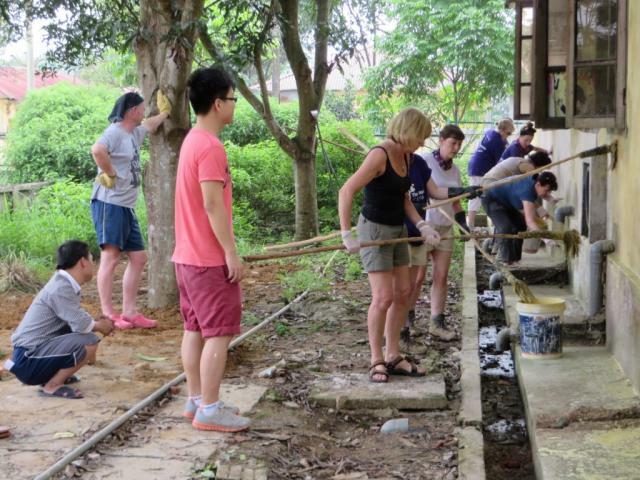 Undertaking community service, volunteer work and doing charity in South East Asia are precious experiences that change school students in the most profound way. Students engaging in life changing programs experience personal growth rarely discovered in regular day to day life. Over the past few years we have designed some of the best vietnam community tours and volunteer programs for student travel and school trips combining with touring around the main sites allowing students to witness first-hand the human face of poverty and individual hardship with aiming to support the local community development as much as we can. “Educating protection of nature and Thai people’s culture in Pu Luong” is a program boosting connection between Vietnamese and international volunteers through supporting ethnic minorities community in the different villages of Quan Hoa, Ba Tuoc district, Pu Luong – Thanh Hoa conservation area to support educational facilities, some necessary skills to improve learning conditions, working environment as well as social understandings and sympathy about difficulties of remote people’s lives. “Education and community development in Coi Village – Xuan Son National park” is a program belonging to a project “Maintaining Dao people’s cultural identity and promoting community tourism in Coi village”. The program draws many participants of Vietnamese volunteers and experts or international volunteers to support and build up a firm background for sustainable development of Dao people whose living conditions are still poor and difficult in Coi village. At the same time, taking part in the program, volunteers will have a chance to experience in a great life of North-West area with Dao people’s culture; a new land or a village bounded with beautiful nature and the mountains of Xuan Son national park. The program “Mai Chau Educational Improvement” is one of activity chains of the projects “Support the development of Brocade Hoa Ban in Mai Chau”, which is not only a program to strengthen the cohesion between Vietnamese and international volunteers through ethnic minorities support activities, to provide practical physical education programs and necessary skills in order to improve learning and working conditions, as well as the understanding of the society, but also the share of the difficulties from society to people in remote areas. Direct support the people with disabilities in Hoa Ban Cong social enterprise – Ban Lac 2, Mai Chau has the opportunity to promote the handmade products made by the female members of the enterprise. Dong Ty village – Thac Ba is a program of the project “Community Development and Ecosystem Conservation” It is held to promote community tourism in Dong Ty village and brings sustainable livelihoods for the poor and disadvantaged locals. Simultaneously, this program brings volunteers opportunities to experience life in pristine ecosystem of Thac Ba lake, one of the largest artificial lakes in northern Vietnam, known as Halong Bay in mountain and having 12 ethnic groups living around. “Education towards the small village” aims at bringing the primary school students in Ta Van a better education with new books, notebooks, etc. In Ta Van primary school, there are over 100 students from most distant villages, so they must walk to school for a long way. Besides, physical and mental deficiencies also become one of main difficulties in learning at school.The responsible travel in Sapa is to help directly the children in the distant villages to have good conditions to live and educate better. In addition to the good learning environment, the children is also educated with living skills, precious experiences and even cultural exchanges with international volunteers from some parts of the world. 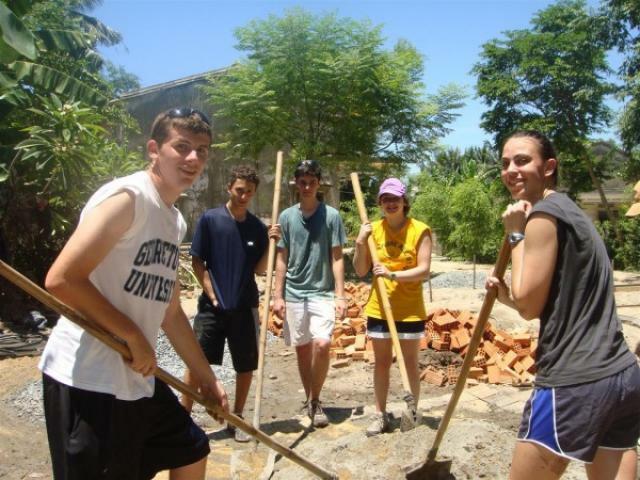 Students are able to participate in community service projects of various size and type that will forever change the lives of those they are working with in countries such as Vietnam, Cambodia, Laos, Myanmar & Thailand. Community Service Projects are determined by the communities themselves with sustainable long term benefits and a focus on educational travel. Community service programs afford students the opportunity to form opinions and places a human face to many of the issues they simply read about or catch glimpses of on the news. Indeed, active participation in a Community Service program leads to feelings of social responsibility and connectedness, an increased care for others and a desire to get involved and co-operate in positive ways – an immeasurable benefit in our increasingly segmented society. Travel with your responsibility will be a wonderful way that can help local communities. Are you looking for volunteer travel or community tours in Vietnam? Contact us today at sales@holidayinvietnam.com to get free community service ideas and detailed itinerary with cost or let our travel experts customize your Vietnam community tours as your own wish. Wanting to see more Vietnam community tours or other Vietnam tours?